We pride ourselves on creating unique and memorable weddings. Our restaurant and conservatory are suitable for both small and medium sized weddings and functions for up to 100 guests. 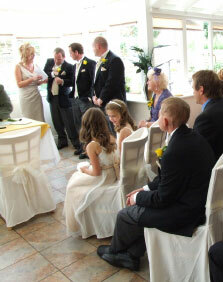 For weddings we close the hotel to the general public affording privacy and tranquillity. We place our dedicated team at the disposal guests to ensure everything goes smoothly. A wide range of menus are available to suit every taste, all freshly prepared by our own chefs. Our evening wedding packages include free overnight accommodation for the bride and groom, and we have ample space for guests who wish to relax and stop over.